The victims, four of whom were hospitalized, were treated for injuries including broken legs and head wounds, Reuters quoted hospital officials as saying. No one was killed in the incident, and rescue teams have managed to evacuate the plane. The company's spokesperson said 101 passengers and a seven-member crew were aboard the aircraft when it crashed; earlier reports suggested there were 172 passengers. The plane is sitting in shallow waters 200 to 300 meters off the end of the runway, local media reported. The cabin broke apart as the aircraft crashed into the sea. The cause of the accident has yet to be determined. The plane had flown from Bandung, the capital of the West Java province, and was landing in Bali Ngurah Rai Airport. 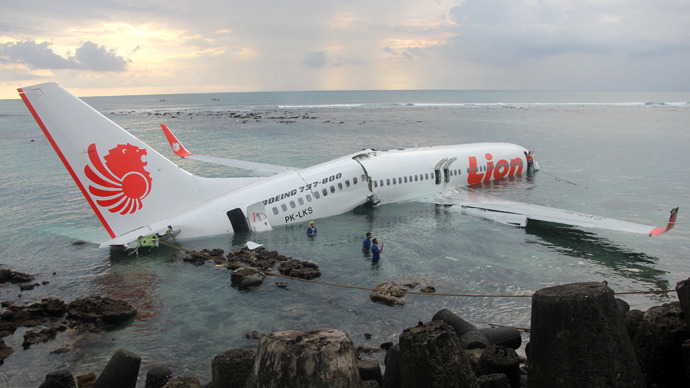 Lion Airlines is Indonesia's largest privately owned airline, and a leading budget airline. In 2012, the company transported some 24 million people. The company is banned from operating in the European Union due to its failure to meet safety standards.